For a brand with such magnificent cinematic continuity Marvel TV sure doesn't know how to connect the lines. I'm not just talking about between the Netflix shows and Agents of S.H.I.E.L.D but really the more connected AoS and the just premiered Inhumans. We've heard the term "Inhumans" for two seasons on AoS since Terragenesis was just introduced and the shows' heroine Skye...or I guess it's Daisy now, was turned into a superhero. That's two years worth of build up to a spin-off, more then enough time to establish a mythos or at least familiarity with what's to come. 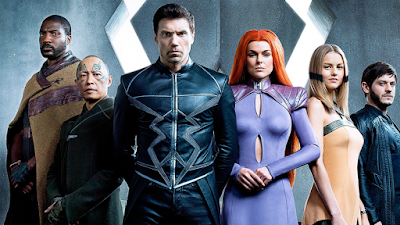 Inhumans ends up being something totally different. Granted, the inhumans shown in AoS aren't full blooded but rather human/inhuman hybrids but it still feels like a major hand-off was dropped. 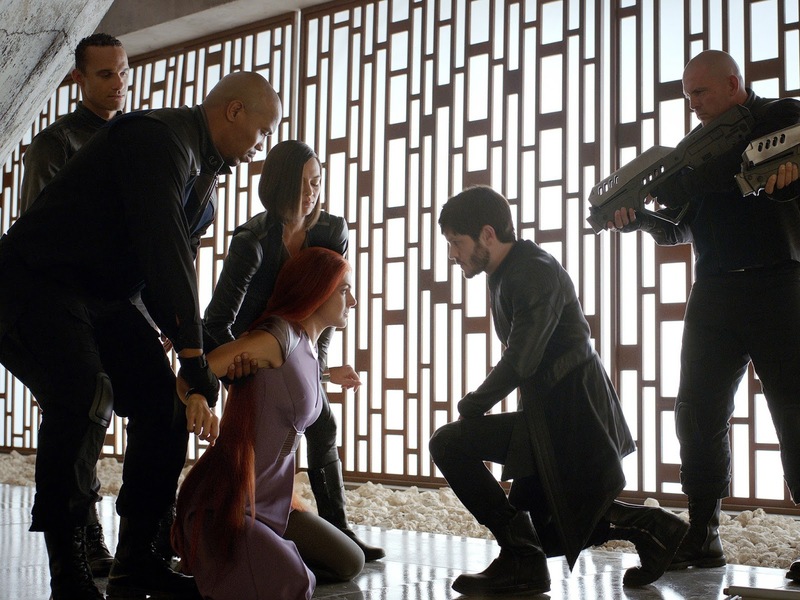 We're introduced to the Inhuman royal family led by King Black Bolt (Anson Mount) and Queen Medusa (Serinda Swan) and are immediately clued into to unrest among the family as Maximus (Iwan Rheon) has a far different philosophy on the future of the inhuman race then does his brother and King Black Bolt. After Trident, another family member on a mission to rescue one of earth's new inhumans, is apparently murdered by earthlings with guns, Gorgon, cousin to the king and head of security, is sent to earth by way of Lockjaw a giant teleporting bulldog to retrieve and/or rescue Trident. The whole thing has been a setup and cover for a coup by Maximus to isolate the Royal family who are one by one teleported to earth to escape capture and execution leaving Maximus as the new monarch of Attilan. Attilan, by the way, if the kingdom of the inhumans which is conveniently hidden on the moon and which remains hidden despite all of the things that we've seen in the Marvel universe thus far. Fun Fact: Attilan, despite being moon based, apparently has a large cattle population based on the standard outfit that uses black leather as a base...just a little thought. Anyone with their ear to the ground on this has heard pretty much nothing but bad things, despite the impression that my into paragraphs may have left I actually enjoyed this quite a bit. The fish out of water aspect of the royal family on earth in Hawaii works surprisingly well and there are impressive action scenes throughout. The main downfall of the show thus far is the CGI. When you have a show with two main characters requiring constant CGI you better have a big budget, trying to skirt by with cheap effects will instantly kill what could otherwise be a good show. Medusa is a prime example, though her CGI need is rectified by the end of the first episode. Medusa, as the name implies, has the power of sentient hair....which is actually cooler then it sounds. Her mane should be in constant motion and respond to her will instantly...it simply doesn't look good or convincing not to mention the color does not work for the otherwise gorgeous Serinda Swan. 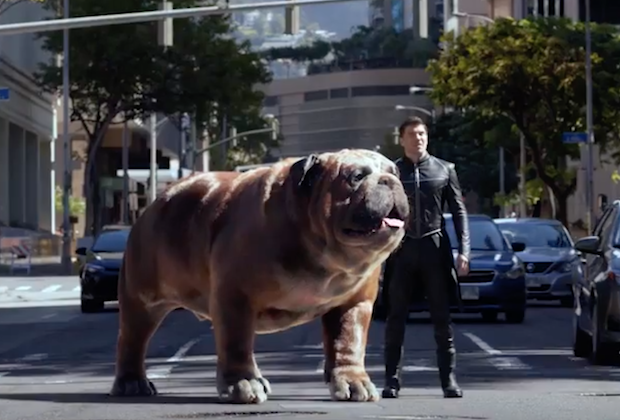 Lockjaw, the aforementioned giant CGI bulldog is the obvious other offender. He leans on the line from cartoony to realistic far too much in the cartoon side of things. Put simply any scene with a major effect pulls you out of the immersion. Other then the effects issue we are left with what has promise to be a good show, I'm certainly on the hook for at least a few more episodes, the writing is good and pulls you into a VERY comic-booky scenario and leaves you wanting to know what the next issue brings. There are some major hurdles to clear here but stranger things have happened. Check in next week and I'll walk you through which path the show begins to take!